Tags and labels may seem ordinary elements attached to your otherwise impressive products but they define your brand and its reputation. A good product has to be well-complemented with quality label or tag to cast the right impression in the minds of your customers. Nobody understands this better than us as we know how custom labels can be used as a marketing tool for your brand. At Organza Bags we are the market leaders of clothing tags and other types of custom printed labels in the United Kingdom catering to clients across different businesses. From gift stores to clothing manufactures and furniture stores we know how printed tags and labels can be used to create a distinctive identity for your business. Quality products with amazing discounts have been the hallmark of our services and generate most of our business from repeat customers. Your kraft labels or the simple brown labels should be just the way you want. We are the most reputable sellers of personalized tags and labels in the United Kingdom and customize to the last millimetre based on your specific needs. If you need a specific colour or size in mind get in touch with our team and we shall design and print these labels to your specifications. We have state-of-the-art infrastructure for tag printing which has helped us set standards for our rivals to follow. Whether you need woven labels or kraft paper tags with special colours and personalization we are here to serve your needs. Our labels and tags are made from eco-friendly materials don’t cause any damage to the environment. You don’t have to run around shopping for clothing labels anymore as we let you place your orders online. 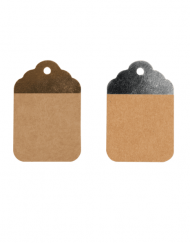 If you are looking for stock brown paper tags they would be shipped immediately after you have completed your order. 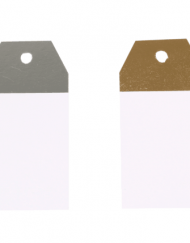 For custom printed tags you have to enter your specification in our order form which allows you to explain your preferences to the last detail and the same would be delivered to you within a few days. We pride ourselves in offering great deals and discounts to clients on bulk order.